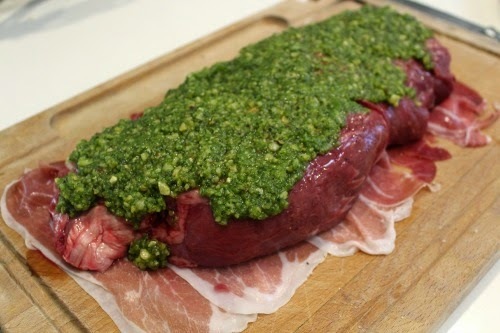 As a rule I am not keen on putting lumps of raw meat on this blog for your viewing pleasure, but this fabulously impressive Beef Fillet with Spinach Dip, Wrapped in Prosciutto, has serious wow factor and it is so easy, that I hope you will forgive me. If you try it, you will. This one will suit all diners at your table, as the slices on the end are well done and as you cut further into the fillet, it becomes rarer. 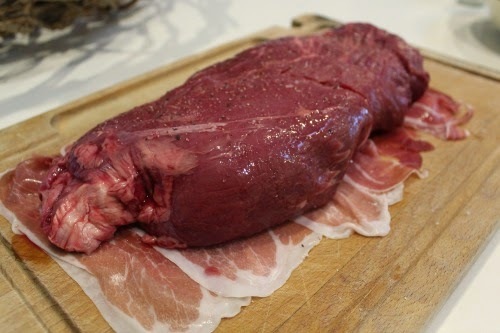 Personally I like my meat very rare. 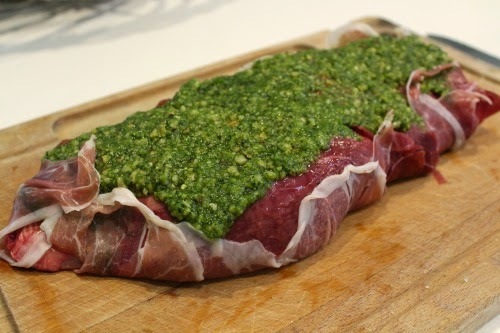 A chef I once worked with in a ski lodge in Thredbo, taught me how to eat rare meat. I am very thankful he did, It is tender, juicy and so much better than over cooked beef. I just reread that and it sounds quite suggestive. As they used to say, if you can't get lucky in Thredbo ski resort, then there's no hope for you. Well I had my fair share of luck back in those days, but I was usually smart enough to keep all my working relationships purely that...... Just work related and there was no variation here. 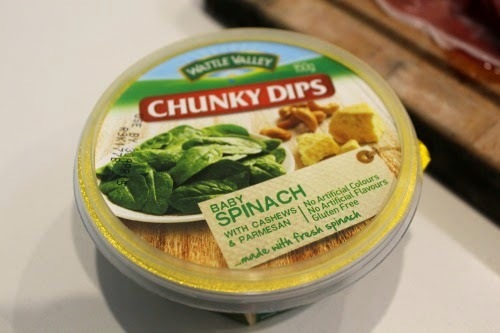 I was not paid to plug the Wattle Valley brand and you could probs use any similar green dip with nuts, but this worked really well. Nor was I paid to plug Aldi eye fillet beef, but it is of excellent quality and always more affordable then anywhere else. This 1.7kg block cost me $30,which for that amount, is excellent value and easily fed 6 adults. Aldi don't always have eye fillet beef for sale in this size, but when they do, I always buy one for the freezer to have on hand for dinner parties. I have photographed the steps for you, to illustare how easy this is to put together. I have written the recipe in one spot lower down, so you can follow it more easily. 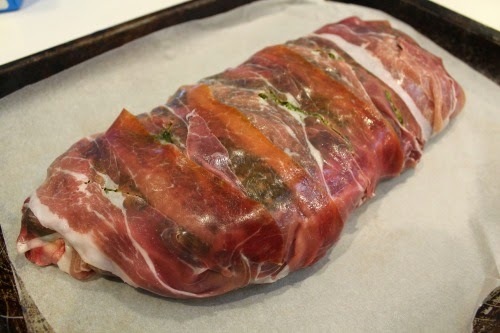 Roast for 45 minutes in the preheated oven. It is essential the oven is correctly preheated. After roasting allow to stand covered with foil for 10 minutes. Slice and serve with rosemary and garlic potatoes and vegetables or salad. You can find more easy and impressive recipe here. Yum makes my mouth water. 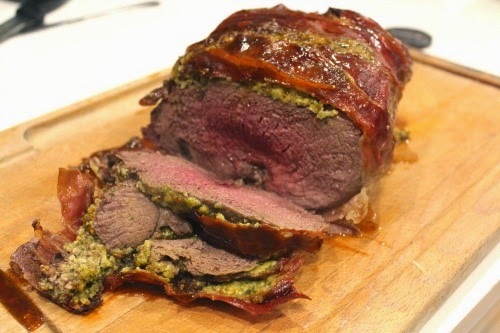 I love filet but rarely eat red meat in my diet. 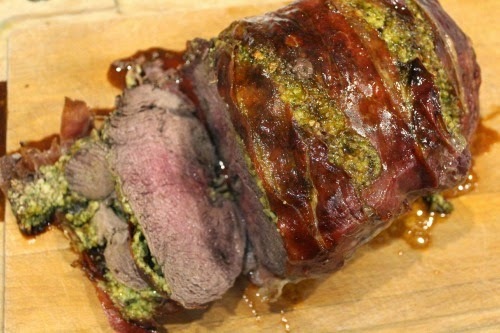 Merci pour le partage d'une recette de boeuf qui me semble succulente !